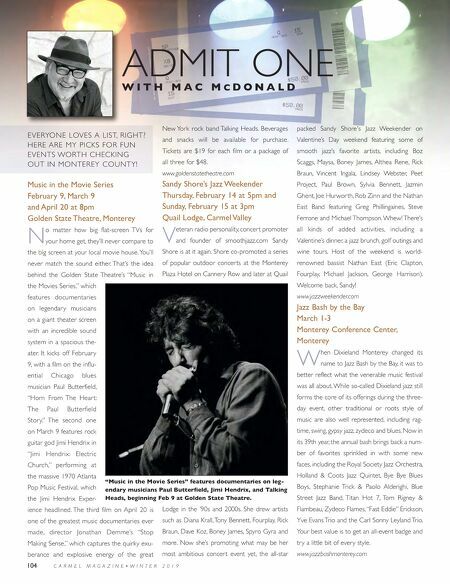 "Across the Great Divide– A Celebration of the 50th Anniversary of The Band" Sunday, March 31, 7pm Sunset Center, Carmel E ven without their historic early collabora- tions with Bob Dylan, The Band would be regarded as one of the greatest American (by way of Canada) rock bands ever. Their 1968 album, "Music from Big Pink," was ranked num- ber 34 on Rolling Stone magazine's list of the 500 greatest albums of all time, and 1969's "The Band," was ranked number 45. Rolling Stone ranked the band itself No. 50 on its list of the 100 greatest artists of all time. This special show is a tribute to the 50th anniversary of the band and features two of the top Americana bands performing today: Eclectic octet The Dustbowl Revival, which blends folk-Americana and Stax- era soul and Austin-based trio Hot Club of Cowtown, which delivers hot jazz and Western swing. The two bands will mix in their originals along with Band classics such as "The Weight," "The Night They Drove Old Dixie Down," "Up on Cripple Creek," "Chest Fever" and "I Shall Be Released." www.sunsetcenter.org. 49th Annual Next Generation Jazz Festival April 5-7 Monterey Conference Center and Portola Plaza Hotel & Spa, Monterey T he annual Monterey Jazz Festival is a highly re- spected training ground for the next generation of jazz musicians, but it's the festival's Next Generation Jazz Festival in April that serves as a sort of farm system that produces the cream of the crop for the main event every September. More than 1,300 of the coun- try's best student jazz musicians compete and perform at the Next Gen Fest, as it is popularly called. These talented young musicians compete every year in big bands, combos, vocal ensem- bles, vocal soloists, as well as conglomerate bands from various schools, to become stars at the fall classic. This year, experienced adjudica- tors and 2019 Ar tists-In-Residence at MJF Allison Miller and Derrick Hodge will be on hand to judge and perform with other clinicians at the Friday night kickoff event. All that and it's free and open to the public, making it your best jazz bargain of the year! www.montereyjazzfestival.org/NGJF Good Old Days Saturday-Sunday, April 6-7 Pacific Grove T he 62nd annual Good Old Days Celebration features the largest arts and crafts show in the county, boasting more than 225 art and food vendors in downtown Pacific Grove, a parade, old-fashioned games and con- tests, carnival rides, a classic car show, a quilt show, pony rides, and a dance showcase. But the community event is earning a reputation as one of the best musical festivals of the year, with more than 60 acts spread out over five stages, including the annual appearance of the jam band Moonalice, whose members have played with Jefferson Starship, Bruce Hornsby, Phil Lesh and Jerry Garcia. The upshot is that it's all free. No wonder they call it Good Old Days. www.pacificgrove.org Scott Bradlee's Postmodern Jukebox Friday, April 12, 8pm Golden State Theatre, Monterey O n paper, it doesn't sound like it would become a huge hit, for example, a vaude- ville version of Macklemore & Ryan Lewis' "Thrift Shop," or a '50s doo-wop version of Miley Cyrus' "We Can't Stop." But that Miley cover got more than 19.5 million views and was named one of the "9 Best Viral Cover Videos of 2015" by People magazine. Since pianist and leader Bradlee founded PMJ, as it is popularly called, in 2009, his creation has piled up more than 1 billion views on YouTube and 3.6 million subscribers. Bradlee, whose musical roster fea- tures more than 70 different performers, still arranges and records a song every week for YouTube and plays hundreds of sold-out shows. Artists PMJ has covered range from Lady Gaga, Beyoncé, and The Strokes, to The White Stripes, Lorde, Katy Perry, Outkast, Radiohead, and Maroon 5, all performed in ragtime, '30s jazz, vaudeville and cabaret styles. Somehow it not only works, it's highly entertaining. VIP packages available for this show. www.goldenstatetheatre.com Across the Great Divide is a performance in celebration of the 50th Anniversary of The Band. 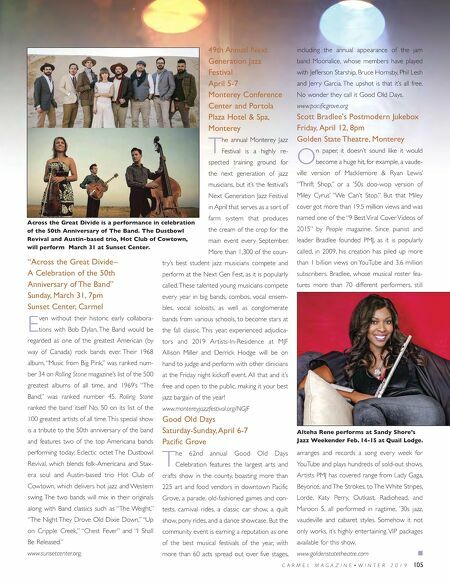 The Dustbowl Revival and Austin-based trio, Hot Club of Cowtown, will perform March 31 at Sunset Center. C A R M E L M A G A Z I N E • W I N T E R 2 0 1 9 105 Alteha Rene performs at Sandy Shore's Jazz Weekender Feb. 14-15 at Quail Lodge.